We worry. It is understandable because we love our boys. We worry that they are doing “nothing” all day. That what they are interested in will not prepare them for the future. That they are wasting their time playing on the computer. That they will not learn what they need to know before it is too late. But we really need to stop and think . . . Is it nothing to be happy? Is it ever really too late to learn something? Is worry even productive? Making sure our boys’ learning lives are a priority is a main focus of our site. If we want to raise boys who love to learn we also need to make sure that they are happy. Long ago I ran across this quote from the 1700s and I loved it from the first time I saw it. Read it and take it in. Think about it and make some changes. Think a bit about this quote and relax. They are being children–and that is perfectly all right. It is who they are. We seem to forget that – they are children. They are not little adults. They do not need to spend all of their precious time as children preparing for the future. They need to be children. Remember, they only get one chance! As far as the claims I hear all too often from parents complaining that their children are doing nothing . . . I can assure you they are most certainly not doing nothing, they are busy. They are doing something that matters to them. They are playing and learning and this is what they are meant to be doing at this time in their lives. Jean-Jacques Rousseau’s quote is from 1762. Just think. For this long (and longer) parents have worried about their children spending too much time playing. Yet, so much research shows that play is the very foundation of learning. Through play, they learn. I think we need to stop spending so much of our time worrying and start spending more of it enjoying the short period of time our boys are young. Show them that you value who they are by letting them run around and play, by letting them follow their passions. Give them as much free time as you possibly can. Drop organized activities if you have to free up some time. Make the effort to clear the calendar so they can play. Please don’t tell them they are doing nothing all day. That is simply not true and to be honest, it is very hurtful to hear that what you want to do is seen as unimportant. They are learning. They are learning about themselves, about their thoughts, and their feelings. They are learning about their bodies, free movement, and how confident they feel when they get part way up the tree. They are learning about nature, how the sun warms their face, how the sand feels beneath their feet. They are learning about persistence and dealing with frustrations and so much more . . .
Give your boys time to be happy, to run around, to skip, play and laugh all day. If you enjoyed this post–please use the sharing buttons, or leave a comment below. Here are a couple of other posts you may like: Life is a Musical Thing and Tell Your Boy How Unique He Is. Wow. This just made me feel really good about myself. Thank you. I needed to read this today. I do let me kids play (ALOT) and I do try to sit down and read to them and teach them and dance with them and sing with them and that list goes on and on. Up until recently I was so concerned with whether or not they were on track with their peers and whether or not they would be on track by the time they go to school so that they could be on track by the time they decided to go to college and raise a family. Then I decided, that I had to stop. I wanted my kids to build strong imaginations and just be wild (to some degree) so that they could find out for themselves who they are. They seem pretty happy now and they haven’t stopped learning at all. They just learn hands on. They learn life skills and they are happy with their childhood discoveries and accomplishments. Instead of me showing things to them all they time they now join in and show “new” things to me. Thank you so much for the nice note. Giving your children a chance to really get to know themselves is a gift that will benefit them for the rest of their lives. You are right – they do learn, no matter what they are doing. Enjoy this time with them. Thank you for visiting! This is a beautiful post – and so true! I think we can get so caught up in making sure kids are getting a head start or trying to fill every moment with a “learning” experience that we forget that fun is important too! Thank you for such a kind comment Emma. You are so right and play provides both fun and learning! 🙂 Have a lovely day. Good reminder to parents everywhere that a child’s job is to PLAY! Thank you for the nice comment. It means a lot to me. You know I agree 100%. I’m glad you like the quote. It is simply amazing to me how much children learn in unstructured play. Yes, I agree with the quote. Kids, especially boys, need lots of unstructured exploring time. One of my favorite memories of this past summer is seeing all the neighborhood kids hanging out on our porch creating games or simply just talking. My 11 year old son and a neighbor’s son the same age who struggle with social situations came out of their shells and opened up. Thank you for sharing your story. It is wonderful for them to have that free time and I am happy to hear that it was of benefit to your son and your neighbor’s son as well. Great justification for we parents and grandparents who feel guilty that we are running from one soccer practice or dance class or event somewhere. It is great for kids to just “be kids” and hang with friends. Part of their childhood needs to be socialization and learning to be just with themselves sometimes – on their level. I have sched some pins and tweets. Thank you Kim, both for the nice comment and for the pins and tweets. I appreciate both. I think people need to slow down a bit and give kids time to just be. I couldn’t agree more about play. I know this post is directed at mothers of boys, but I think this also holds true for girls as well. As a mother to two young girls, I will keep this quote and this post in the back of mind as they grow. Thanks for sharing and inspiring to let our little ones play. Their “nothing” is surely something! Thank you so much for the nice comment. Girl moms are always welcome 🙂 My website just has a boy focus. Everything here does indeed apply to girls as well. Enjoy playing with your girls and watching them learn and grow. It is so true. Kids need play. That is how they learn anyway, besides being happy. Thanks for the comment Beth. They do need to play, they really do. This is an amazing quote! I shoo my kids outside at every opportunity. I welcome the chance for them to be “bored”. Because it never takes them long to find something to do! I agree Jamie, I really like the quote. It is so true isn’t it? I always say boredom doesn’t need to be fixed for exactly the reason you state. They find something to do! Beautiful, beautiful post! I just love this. I myself have struggled with “do they play to much” but as unschoolers I’ve also seen how it works. It’s funny that we are not the only generation that has worried about this. And yet our worries seem to be unfounded. Thanks so much for a great post. Sharing everywhere! Erin, Thanks so much for your comment – you made my day. It is hard! Trusting that they will learn, trusting that play is important is hard. When I first saw that quote I couldn’t believe the date on it either. Thank you very much for sharing this post. It means a lot to me. how true it is! My husband is a work in progress when it comes to the understanding and realization that our son does not need to be busy with activity after activity in order to be ‘ productive.’ More and more my husband sees that it is ok to just let them be! Great post, pinned! Thank you very much for pinning. It is hard to let go of some of the things we have been taught or that society seems to lean toward and let them just be. I think too that it becomes increasingly hard as they get older and that is the time it may just be the most important. What a great post! And so true. I think we always worry about parenting and spending time with our kids. Getting balance is so important. 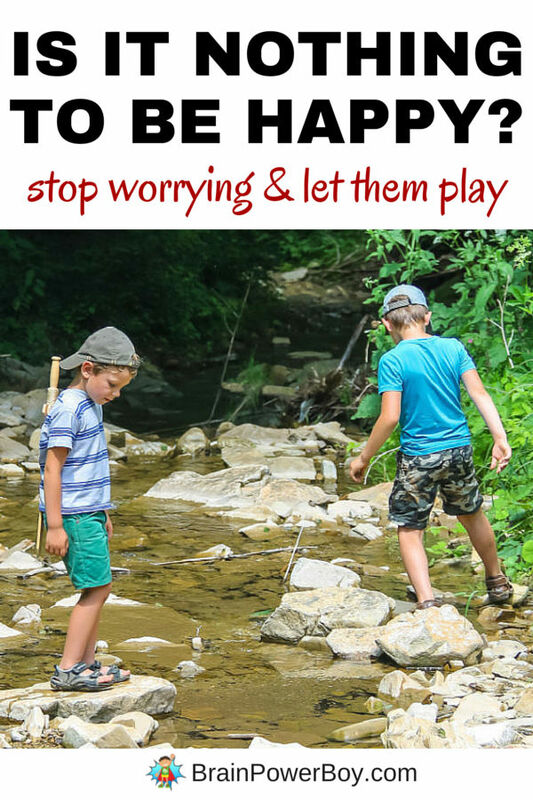 Letting them just be and play by themselves doing nothing is so important too! Clearly parenting doesn’t change much! I am one generation removed from most of other bloggers, I am a grandparent.IMO parents are burning out their children by sending them to this that and the next thing most nights of the week and then more stuff at a weekend. What is wrong with letting them be “bored” for their imaginations to kick in, for them to find their own amusement and grow up grubby along the way? Imagination needs time to develop and grow and learn as it goes, children need to learn by their mistakes and fall out of the odd tree or off a climbing frame, they need to assess the risk and complete the challenge. Failure leads to learning. I feel we are building a generation that feel it is wrong to come home from school and chill, what impact is that going to have on them as adults when they then feel they cannot come home, kick the shoes off and read a book/watch tv/do nothing because it has been instilled in them from a young age you just do not do that, leading to them burning out and being unable to function at all. I agree with you Elaine. There are too many outside activities and adult controlled activities and it is taking precious time away from children. Time they need to use for free play and for using their imaginations. Thank you for your thoughtful response. I enjoyed reading what you had to say and I’m sure others will as well. Thank you so much Claire. I really appreciate your kind comment. It can be hard to remember that. Especially when the pressures of society creep in! But it really is true. I believe he is saying that the child will choose to have a multitude of things he wants to do and that he will be truely engaged and busy doing those things. 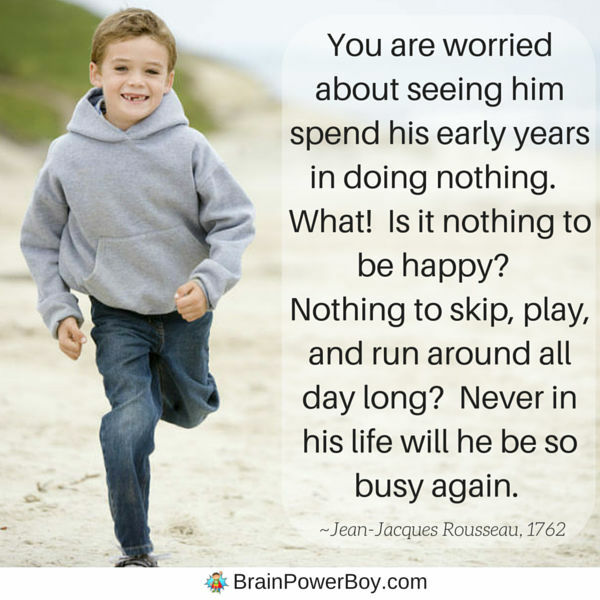 It contrasts the section of the quote that alludes to adults thinking that children are not doing anything of importance (being busy doing things that matter) when they are playing.